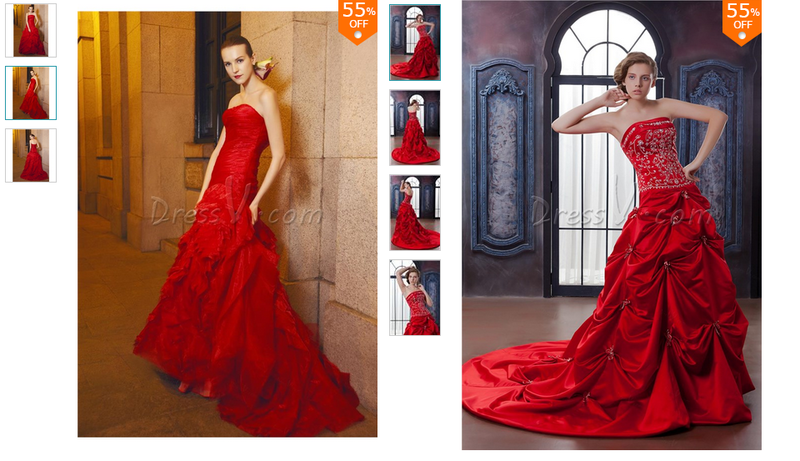 They have some awesome Red colour wedding dress collections which are gorgeous for the reasonable price. The top left Red bride dress is a Charming Mermaid Ruched Strapless Cascading Ruffles Pageant Evening Dress which is opt for evening weddings. The top right bride dress is a Flamboyant Ball Gown Strapless Chapel Embroidery Anita s Bridal Gown which include some wonderful bridal work to make the gown pretty. The second left bride dress is Fabulous Ball Gown Sweetheart Sleeveless Embroidery Ela s Color Wedding Dress which I personally loved it very much. The Second one is Glamorous Ball Gown Floor-Length Strapless Tierd Wedding Dress which will make the bride to look like a Doll for sure and I loved this too very much. The bottom right bride dress is a gorgeous Flamboyant Ball Gown Strapless Chapel Embroidery Bridal Gown can make a bride looks like a Beautiful Fairy. I loved the purple one very much and it is looking gorgeous!!! It is a Gorgeous A-line One-Shoulder Floor-Length Pick-ups Beading Dasha s Wedding Dress. The first one is Fabulous Trumpet/Mermaid Sweetheart Floor-Length Court Pick-ups Color Wedding Dress and the last one is Affordable A-line Strapless Chapel Train Wedding Dress.